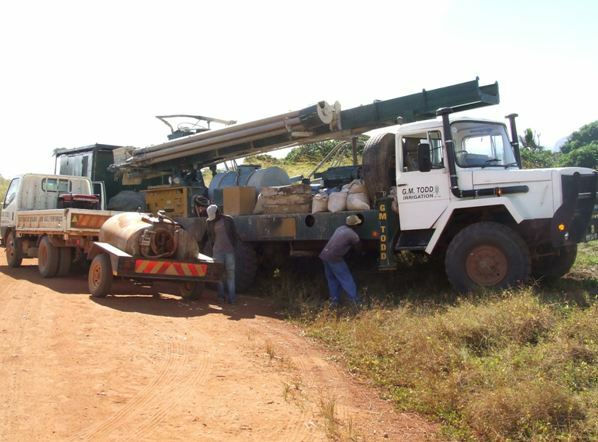 Reverse circulation (RC) drilling is gaining recognition and is already the most common mineral exploration drilling method used in many parts of the world. This method of extracting accurate sampling is unbeatable for obtaining accurate and uncontaminated rock samples at high speed and low cost. G.M. Todd has machines equipped with RC drill strings to drill to depths of up to 300 meters. Fitted to these machines we have cyclones with splitters. The cyclone serves to reduce the speed of the sample stream, and to separate the sample from the air, allowing it to collect. The purpose of the splitter is to divide the sample down to a smaller size that is an accurate representation of the complete sample. This assay of samples are collected and sent to the laboratory to be analysed for various minerals. Reverse circulation drillinghas its potential safety hazards, G.M. Todd endeavours to abide by normal safety requirements, and has the following safety management system in place where all hazards are assessed and most managed through procedure. 1. Manual handling: Strains and injuries can be received with handling of heavy samples, hammers, bits etc. 2. Falling objects: Due to the vibrations involved in Percussion drilling there is potential for objects to shake loose from rig mast. Correct maintenance and regular inspection required. 3. High Pressure Air: All HP air hoses, including sample hose have sock type restraints on each end. All sample hose clamps are correctly fitted and inspected daily, and couplings tightened. 4. Pinch Points: There are many areas around the machine to get pinched or crushed. Mast boom and rotational head movement, rod loader movement, cyclone tilt and rotate, and cyclone doors can all present some hazard. Procedures and communication between driller and sampler are essential here. 5. Personal Protective Equipment (PPE): Appropriate (PPE) is used at all times; ear plugs, dust masks, safety boots, hard hat and gloves. Reverse circulation drilling has its potential safety hazards, G.M. Todd endeavours to abide by normal safety requirements, and has the following safety management system in place where all hazards are assessed and most managed through procedure.